Stashbustin’ #16 finally has buttons! I was walking through Joann’s this week and these puppy buttons caught my eye. They are super cute and matched my chocolate yarn. And it made me think of that commercial on TV where the little girl talks about her puppy brother, lol. So of course I had to buy them. I was hoping to snag some pics of this on a real baby this week but my friend’s sweet Baby B has an ear infection. So we snuggled instead of having a photo session. I’m off to work and to get ready for my parents to visit this weekend! TGIF!! 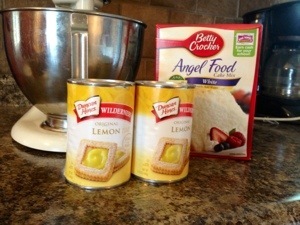 All I needed was an angel food cake mix and lemon pie filling. Easy, quick, and low maintenance! I combined the two together in my mixer. 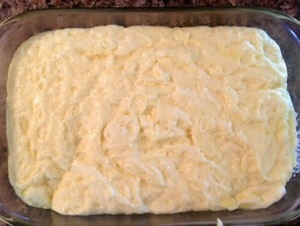 Was a bit of a strange texture but I may not have mixed well enough in fear of over mixing. Slipped in a 350 degree oven for 30-32 minutes. It was only slightly brown on top. 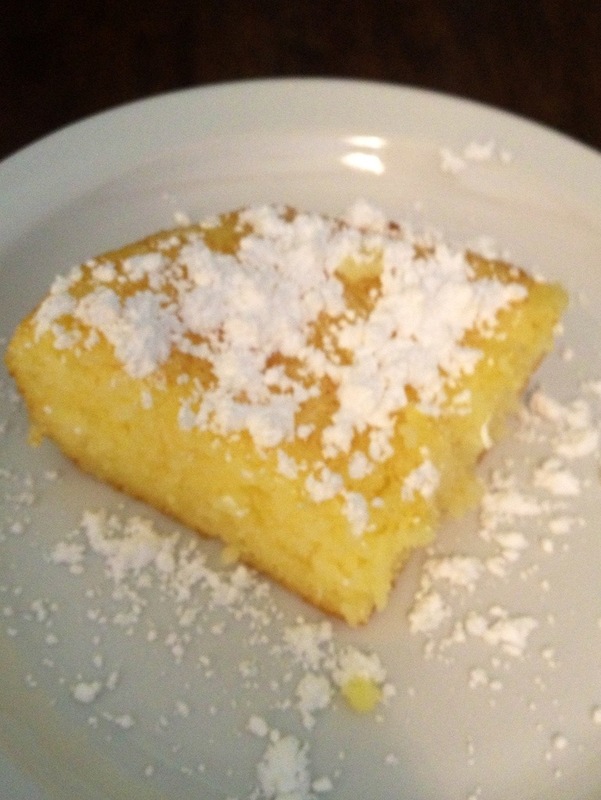 Then after cooled I cut and served with powdered sugar. 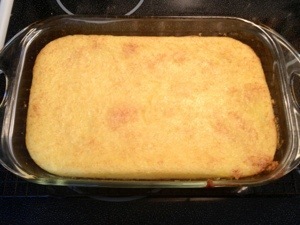 It is a very spongy cake. I wouldn’t categorize it as a bar so much. It was very lemony and not overly sweet. Tasty none the less. But next go around I think a lemon icing or glaze would punch up the sweetness to cut the tartness. This recipe is so easy and quick it’d be great for last minute baking needs. And it’s very pretty on a plate. For a Pinterest recipe this wasn’t too bad. Not the finest I’ve ever had but I’m not one to turn down desert! I’ve made fairly good progress on my Billow Blanket or Stashbustin’ #15. The yarn is a DREAM to work worth. It’s silky soft cottony goodness is just so luscious under my fingers. 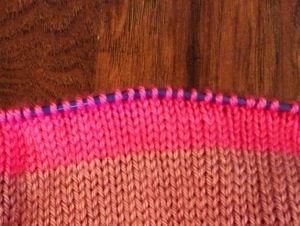 And the thick to thin texture is displayed nicely in the stockinette stitch. I’m on my second color stripe (of six) and realizing this is going to be ONE BIG BLANKET. I’m not going to fuss over that right now. I’m just enjoying the pattern and the yarn and will see where the knitting leads me. This has been my go-to knitting on the couch at night while I watch TV or help the husband with college algebra. This is a horrible iPhone photo I took last night. But it give you the idea. I started with a dusty pink color and transitioned to a bright pink. In skein form the colors looked much better in this order but now that they are in knit form they look very different. I simply cannot decide if it bothers me. On one hand it’s very kooky just like Aunt Martha. On the other hand it’s NOTHING like me and I’m the one stuck staring at it as I knit. I still have a light baby pink that I’m planning to finish the outside with. Maybe that will make it better? 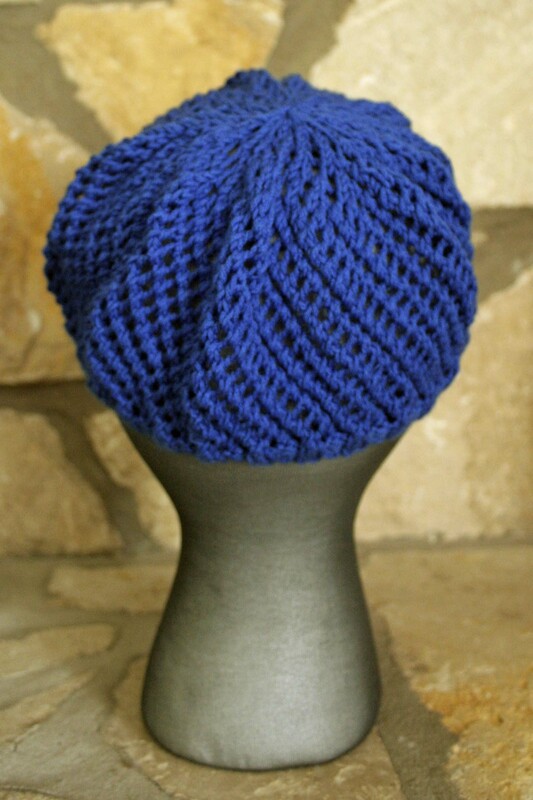 I am a big fan of the latest craze of ruffle yarn. 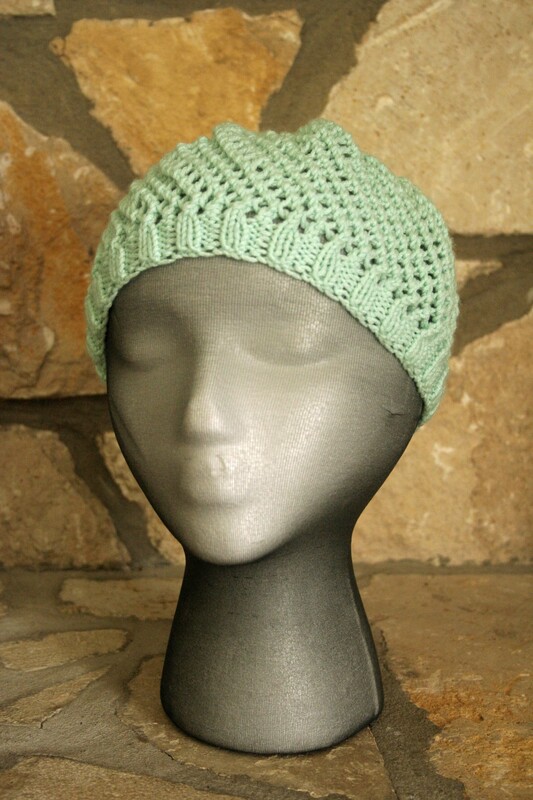 I’ve tried everything from Red heart, Starbella, Berroco, and all kinds of other brands. I found them each to have their strengths and weaknesses. 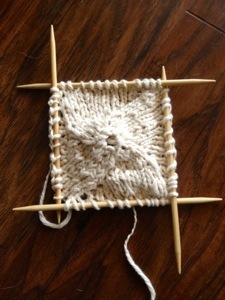 But they all had one thing in common….a twist as you pulled the yarn from the center or unraveled from the outside. After a 50 or so scarves and really cool recent test knit I can’t tell you about yet I think I’ve found a process to deal with it. Start with center wound ball. 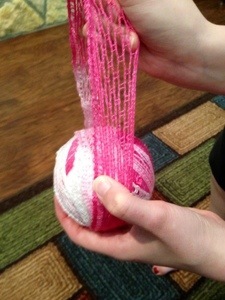 Unwind using center pull end while opening and flattening the yarn to take out the twist. Once flat begin to wind into a ball. 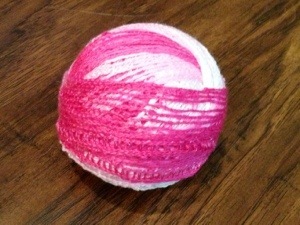 This tape style winding takes most of the twist out of the yarn and your are left with smooth ball with flat yarn. I find that I have to “fix” or untwist the yarn A LOT less while actually knitting. 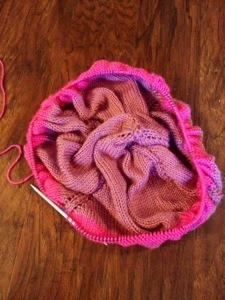 It does take some extra time at the beginning but is much less tedious during the knitting process. Hope this tidbit helps! Happy Tuesday!! I have been thinking about writing this post for several days. By now everyone has seen the awful destruction in Moore, OK. I have a very dear 78 year old great aunt that lived smack dab in the middle of Moore. I got the phone call last Monday while I was at the gym from my father that her house had been hit but we didn’t know where she was or how she was. I flew home and switched on the news. At that point I couldn’t even imagine how she could survive that destruction. So I started knitting. I pulled three skeins of Carron Simply Soft in shades of pink and cast on another Constant Baby Blanket. I had the pattern memorized from my Stashbustin’ #15 project. And so I knit and worried. After five long hours we learned that her neighbors had pulled her and her yorkie from the rubble of her home. Her home was literally at ground zero and was hit by the middle of the funnel. Her home is flat and she had no less than five cars on or in her house. She was taken to a hospital and treated for lacerations and shock. But she was going to be ok. Thanks to the amazing 15 minute warning she had time to take cover in a closet. (Fifteen minutes is amazing in tornado time for those who don’t live in the Midwest). There is absolutely no reason other than the grace of God that she is still with us. I’m terribly afraid of tornados. I have been far to close to far too many. And I struggled to reconcile my fear, grief for the loss of life, and joy that Aunt Martha and Hallie (the yorkie) were ok. So I’m just going to keep praying and knitting. This blanket has moved to the front of my projects and I have named it Aunt Martha’s Prayer Blanket. I hope to finish it and send to her in her new home, wherever that turns out to be. She lost so many keepsakes and antiques. My relatives helped her salvage what they could and managed to save her a few truckloads of items. Stitch by stitch I will knit all the love and prayer I can into this blanket for her. It calms my fears and hopefully will give her some comfort. She has survived so much in her life that I hope I have her strength one day. The darkest pink is in the middle and will fade to a light pink. It may seem dark in the beginning but with love and support it will get better. Sorry for the sappy post but I needed to write it down to help me process it. I now return you to regularly scheduled knitting posts!!! I broke my stashbusting trend a bit. I had to swing over to the Yarn Barn, my LYS, and get more Soak. And I browsed while I was there…. 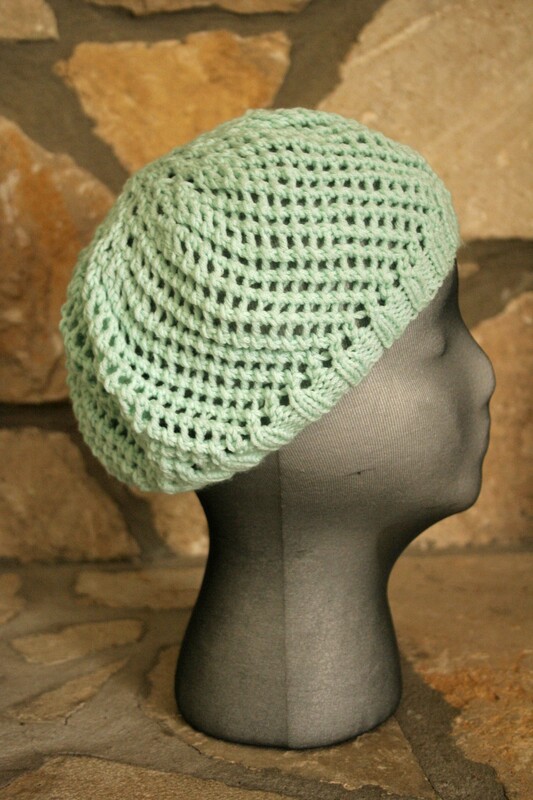 It’s 12 hanks of Berroco Pure Pima cotton in green. It’s a new yarn from Berroco. (I think I’m quickly becoming a Berroco kind of girl) It’s very spring like to me and just called my name. 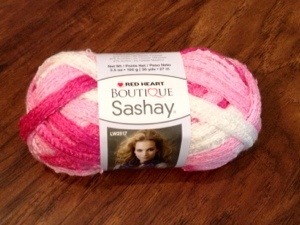 It’s a very soft cotton and I can’t wait to try it! I have so many other WIPs it will have to wait a bit. For now I’m just going to mark up the directions for my size and read the pattern through a few times. 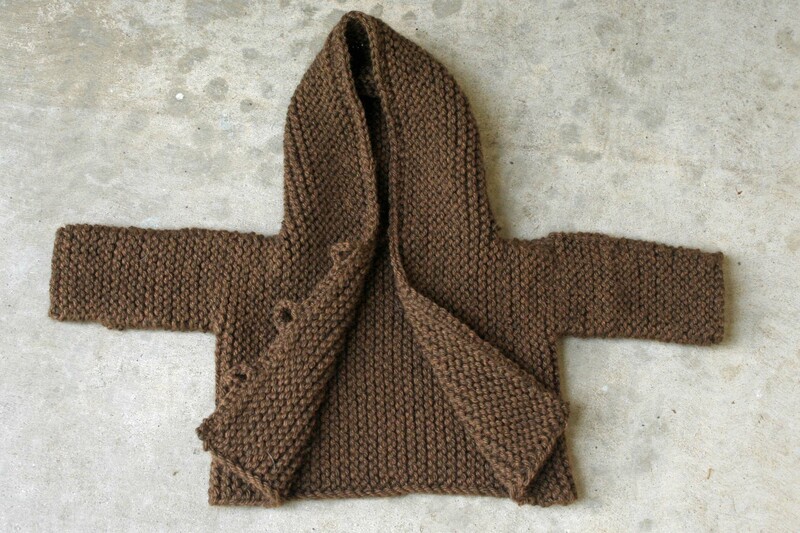 It’s by far one of the most complicated sweaters I will attempt. It uses the contiguous construction method, which looks amazing. For now it sits in cakes on my craft desk and I fondle it every time I walk by, lol! The hubs and I are off to a BBQ for lunch with friends and some relaxation!! I hope you have an awesome Sunday!! P.S. I did remember to buy Soak as well. That justifies my trip right? When I was organizing my craft space vi found five hanks of some Berroco Vintage Chunky in purple. I made my last two sweaters, Mud Season #1 and Mud Season #2, from this yarn. I love this yarn! It’s wool blend that’s soft but yet easy care. 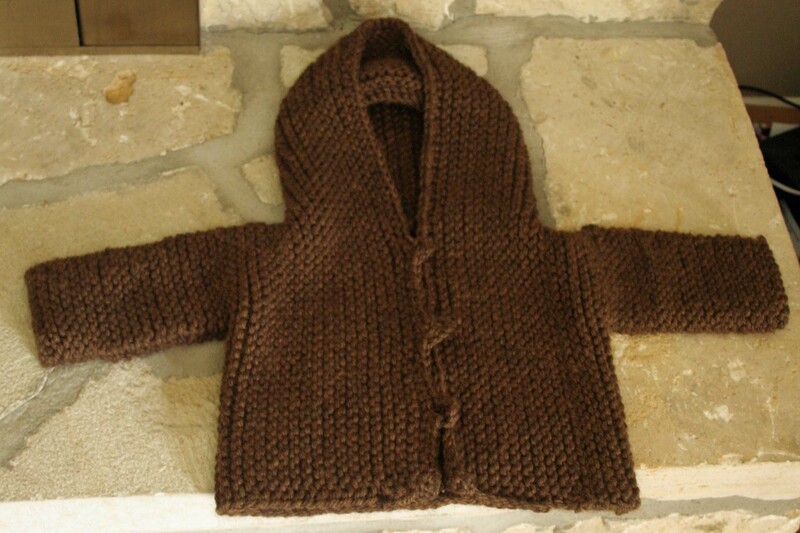 It knits up beautifully and who doesn’t love chunky projects? 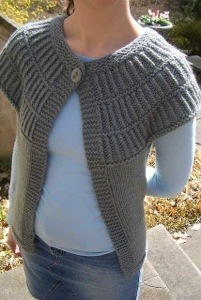 I have settled on my next stash buster: Shalom Cardigan by Meghan McFarlane! I’m terribly excited! And thanks to the tips on the pattern page I’m going to alter this a bit to fit my bust size by simply making the garter border a few stitches bigger. I’ve also been a good girl and swatches for gauge. 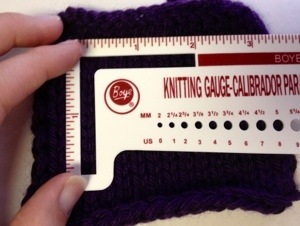 I had to go down to 10 1/2 US needles to get gauge on my unblocked swatch. I’m probably not going to wash or block this swatch as I didn’t get any difference in my last two Vintage Chunky swatches. And I’m out of Soak and need a trip to a yarn store, lol. It’s a three day weekend for me thanks to Memorial Day. I’m hoping to give this sweater some attention this weekend. 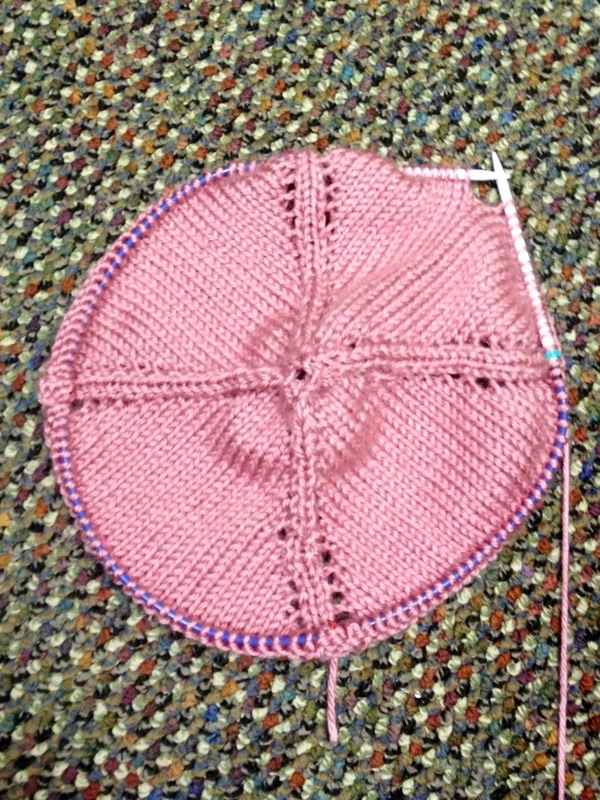 But I have several other WIPs and a test knit for a new pattern by a fellow blogger. 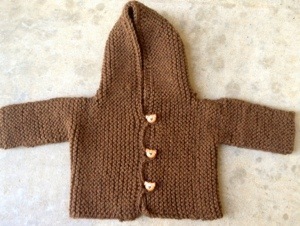 I’m also excited about this test knit, it’s completely adorable!!! And the hubs and I have several projects in our new house. 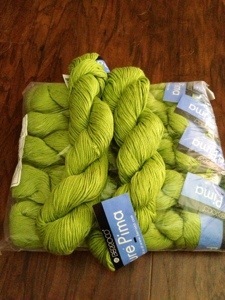 Not to mention I might need to make a trip to the yarn store…hehehe. I’m sure I can get it all done right? So these hats are gift wrapped and ready for delivery to their new owner. 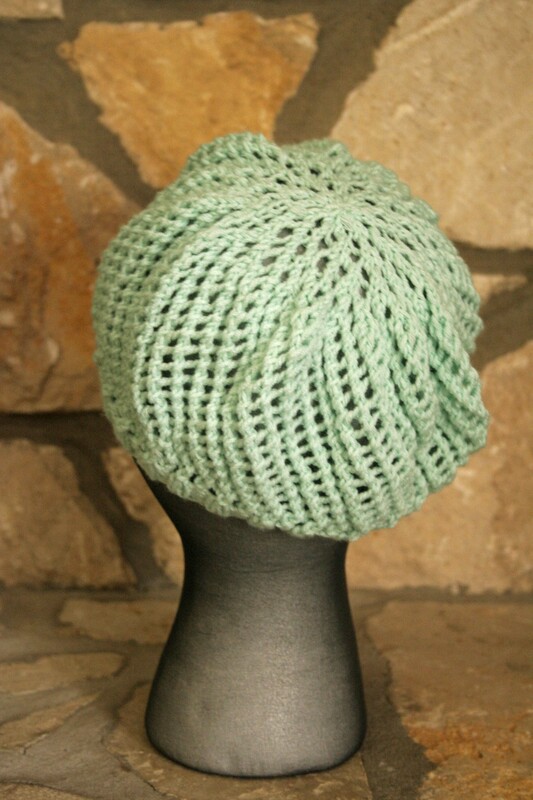 And I’m ready for weekend of relaxed knitting in front of the TV watching the Women’s Softball College World Series. It’s pretty much the only sport that the hubs and I will watch together. I hope everyone out there has a great weekend planned! Stashbustin’ #15 is kicking my rear end. I can’t tell you how many times I have started and then frogged! Pretty right? Only to realize that I was reading the pattern wrong! Grumble grumble grumble curse grumble grumble…. So I’m off to frog this again and start over. I will not let this blanket beat me!! Thank goodness tomorrow is Friday!!! Stashbustin’ #16 is almost complete! I bound off the last edge last night as I was catching up on my DVR. I had to pull in a lamp this dark yarn really started to play with my eyes as I was trying to pick up and finish the crochet edge, lol. 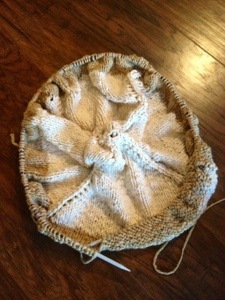 However, I love love love using the leftovers of my Berroco Vintage Chunky from my Mud Season. I haven’t found a yarn that Berroco makes that I haven’t liked yet. And it didn’t hurt that this project was chunky yarn on my big needles, lol. I didn’t exactly follow the directions to a tee….not that they weren’t very well written! Hinke did a great job of spelling things out and including lots of links to tutorials. I just kinda took her directions as suggestions, lol. I used a knitted on cast on instead of the crochet on waste yarn. 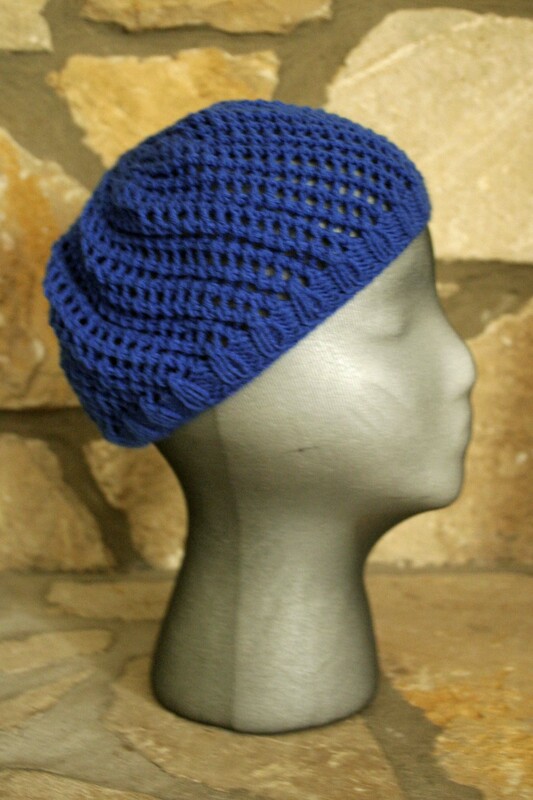 I also cast off in pattern instead of a sewn method. I also accounted for three buttons instead of two. 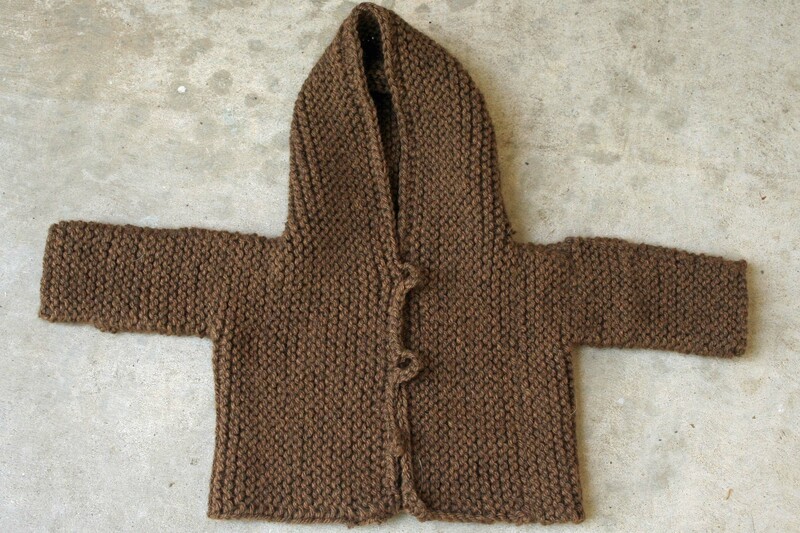 And finally I crocheted all the way from the left bottom corner, around the hood, and down to the right bottom corner. I still need to find the right buttons for this project. But I’m not in a rush. I think this little sweater is going to stay with me. It’s the partner to my Mud Season and hopefully I can bundle up a little one in this when the hubs and I decide to have kids. And then mommy and baby can match. That means the buttons have to be special. 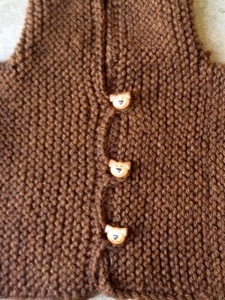 Next up for this sweater is a good bath and blocking! !